We have all had “ah-ha” moments. I had one on October 15, 2013 listening to Dr. Razelle Kurzrock illustrate a new way of thinking about cancer and cancer drug development. Historically, cancers are categorized by the organ in which they originate. With the advent of genomic sequencing, cancers can now be grouped by the mutations they contain. Thinking about cancer in this way will revolutionize how this disease is treated therapeutically, researched in academia, targeted by drug companies, and conceptualized in clinical trial design. This epiphany occurred at the recent meeting of the Southern California Chapter of Women In Bio at Janssen Labs, while listening to Dr. Kurzrock, one of three excellent speakers at the meeting. Dr. Kurzrock pointed out that, while the light microscope was invented in 1590, it is still used today to diagnose cancer. While current cancer therapies are not quite as ancient, treatment for many cancers has not changed for up to 20 years. This is shocking, given the enormous strides in technology that have occurred in the last two decades. Most importantly, we need to change the paradigm of thinking of cancer as an organ-centric disease. Molecular abnormalities in cancer are not associated with the cancer’s organ of origin. Hence, we should treat cancers based on their molecular profile, not on where they originated in the body. we can analyze the molecular signature of each cancer. 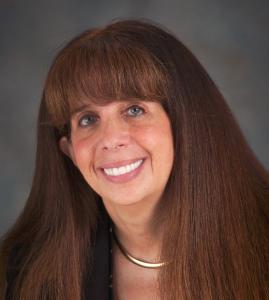 Clinical trials need to be redesigned to be mutation-centric, not drug-centric. Multiple genetic markers should be employed to diagnose and classify cancers. Generally, clinicians are entrenched in their way of thinking, which presents an obstacle to this kind of fundamental change. To paraphrase Max Planck, science progresses one funeral at a time. Regrettably, medicine also seems to progress this way. Previous ways of thinking about cancer have become so ingrained that many are not even aware of their underlying assumptions. The concept of classifying cancer by mutational profile will also impact cancer research. How many times have you heard of a laboratory studying breast cancer, or prostate cancer, or liver cancer? Several more times than you hear about a laboratory studying a particular mutation in a cancer biomarker like the epidermal growth factor receptor (EGFR), I’ll bet. Further areas of inertia include applications for new drugs submitted to the Food and Drug Administration (FDA). No application for an investigational new drug study (IND) has ever been filed based on a treatment targeted at a mutation in a cancer (of any kind), rather than treatment of a cancer in a specific organ. This situation persists despite the fact that the FDA has indicated it would be open to INDs using this approach. 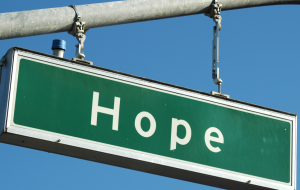 Hope for new cancer treatments–turning in a new direction. 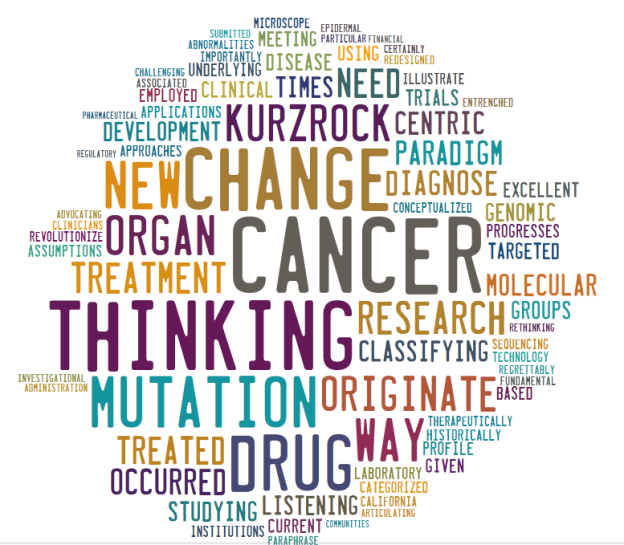 I hope the idea of classifying cancers by the mutations that drive them, not the organ in which they originate, changes how cancers are treated. Dr. Kurzrock did an excellent job of articulating and advocating for these changes. Employing old-school approaches to cancer is so engrained that we are often unaware of these underlying assumptions. Rethinking cancer biology certainly has changed how I would respond to a loved one being diagnosed with cancer. I would seek out a forward-thinking doctor, willing to utilize this new paradigm from the onset, not waiting for last-ditch efforts once the cancer re-occurs. Challenging the current methods for treatment, research, and drug development will not be easy, given with the institutional barriers that remain. Financial interests of the institutions involved will need to be realigned with this new paradigm. Either that or we need AIDS-activist-like protests to spur on this change in thinking. In the end, as with AIDS, it may be patient advocacy groups that can best bring about this change in thinking in the medical, pharmaceutical, research, and regulatory communities. The views expressed here are solely those of DeeAnn Visk are not necessarily those of Women in Bio, AWIS-SD, Janssen Labs, NPR, or your local NPR station. A special thanks to Nurith Amitai for her especially helpful editing. This article was previously published in the January/February 2014 edition of the Association for Women in Science San Diego Chapter Newsletter. This entry was posted in Cancer, clincial trials, Genome and tagged cancer treatment, DeeAnn Visk, genome, health, science writing on April 10, 2014 by admin.